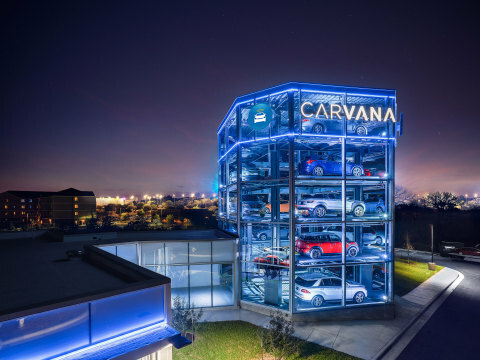 AUSTIN, Texas--(BUSINESS WIRE)--Carvana, a leading eCommerce platform for buying used cars, announced today the opening of another one of its signature proprietary fully-automated coin-operated Car Vending Machines in Austin, Texas. Only the third of its kind in the country, Carvana’s Austin Car Vending Machine launches just two months after its counterpart in Houston, and will offer a unique and innovative pick-up experience for customers who purchase a car online from the company. The Austin Car Vending Machine is conveniently located to the south of Stassney Lane in southern Austin, at 6014 S. IH-35. The all-glass structure stands five stories tall, contains three delivery bays and stores up to 20 vehicles that are loaded in advance of a customer’s pick-up. In addition, Carvana customer advocates are available on-site to help facilitate a personalized and memorable pick-up experience. Carvana customers begin their experience by searching for and buying their desired car online at Carvana.com in as little as 15 minutes using a mobile phone or desktop computer. Customers can also trade-in a car and secure vehicle financing through Carvana if desired. Once the purchase is complete, customers can choose to have their car delivered directly to their door as soon as the next day, or they can opt to pick it up at one of Carvana’s Car Vending Machines. At the time of pick-up at a Vending Machine, the customer receives an oversized Carvana coin to drop into the coin slot, activating the Vending Machine. The purchased car is then automatically retrieved from the tower and conveyed through the machine until it reaches a delivery bay, where the customer takes possession. Customers have seven days to test own the car and make sure it meets all expectations. Within that window, if customers are not completely satisfied, they can return their car for any reason for a refund. Hours of operation for the Austin Car Vending Machine are Monday through Saturday from 9am to 7pm CST. As always, vehicle pickup at any of Carvana’s Car Vending Machines is free for all Carvana customers. For those customers who live 100 miles outside of the Austin metropolitan area but want to pick up their car at the Vending Machine, Carvana will subsidize $200 in airfare and arrange white glove transportation from the Austin airport. To learn more about Carvana and its coin-operated Car Vending Machines, visit: carvana.com/vendingmachine. Founded in 2013 and based in Phoenix, Ariz., Carvana’s mission is to change the way people buy cars, giving customers a better car-buying experience by removing the dealership infrastructure and replacing it with technology and exceptional customer service. By leveraging eCommerce technology, Carvana is transforming car buying, creating a start-to-finish online shopping platform that has allowed customers to complete their purchase in less than 15 minutes, and in 2016 saved customers an average of $1,461 per purchase versus Kelley Blue Book’s suggested retail price. Additionally, Carvana launched the world’s first-ever automated, coin-operated Car Vending Machine in Nashville, Tenn.
Carvana offers consumers an intuitive and convenient online automotive retail platform, with a fully transactional website that enables consumers to quickly and easily buy a car online, including finding their preferred vehicle, qualifying for financing, completing the purchase and loan with signed contracts, and receiving delivery or pick-up of the vehicle as soon as the next day. Carvana cars are guaranteed to be accident-free, undergo a rigorous 150-point inspection and feature a 100-day/4,189-mile bumper-to-bumper warranty, as well as a 7-Day Test Own period during which customers can return their car for any reason for a full refund.